Tree root in Angkor Wat. The girl is a Japanese tourist - she's just there for perspective! Au didn't turn up for breakfast yesterday morning. This is not unusual. Our senior cat has his bowl of fish anytime between 6AM and 9AM. Occasionally he comes home from his morning patrol and goes straight to bed, reserving breakfast for lunch. But yesterday morning he just didn't turn up. At 11AM I got really worried about him. Accompanied by Target, I check the various places Au likes to sleep: the cupboard under the stairs, the laundry stack, the spare bedroom, the rug in the upstairs office... but there was no sign of him. I called outside and still there was nothing. By now it was 1130 and I was getting very worried. I was debating whether to ask the neighbours if they'd seen Au when he walked into the kitchen, sat down and yawned. I was so relieved, I picked him up and hugged him. As a sensible cat who is not into hugs, Au was of course upset by this. He put his ears back and pushed me away. Get off me, you silly woman, his look said. But when he realised I'd been worried about him, he relented and rubbed his head against my chin. He then took immediate advantage by demanding a big breakfast. I still don't know whether Au was in the house all this time or whether he was out somewhere. But one thing's for sure: he is currently residing in bed. And by the way he's parked himself on a tangle of bed sheets it looks like the bed won't be made for some time. I don't care. All that matters is that Au is home. I went to Siem Reap in Cambodia last week and finally got to see Angkor Wat - the temple ruins that date back the 12th century when the Khmer kings were big noises in what is now Indochina. Between the 11th to the 13th century, the Khmer Empire ran over much of what is now Vietnam, Laos, and Thailand. In gratitude for their power, the kings set up dozens of temples in their capital city, Angor. Today Angkor is gone but nearby Siem Riep that was also a capital on and off for centuries is thriving. We had a great time there and can recommend a visit. More on this on Friday! While I was excited to go, the cats were not. Target draped himself over my clothes, spreading fuzz all over each bit. I guess he thinks this will warn off any impertinent foreign kitty who tries to cozy up to me! They had Tom at home all this time but you know how cats are: they like a complete family around them at all times. I thought they might sulk and show me their tails when I returned, but after an absence of four days, both Au and Target welcomed me back with open paws. They are very sweet natured. So after my trip I'm energised. And this is to announce there are going to be some changes! 1. I am taking off one day a week - every week! And possibly two. It's time I had a life that's not work. 3. I'm going to turn up the heat on finding an agent for my romance novels. I want a change of pace by the end of this year so I had better get cracking. I have just written off to Harlequin Intrigue to sell one and am now looking for an agent for my second novel. It's an action/suspense/romance. Anyone got a suitable friend or relation in the business of agenting or publishing? Finally, I'm not going to feel guilty about stuff I can't fix. It's time I had some fun, and this month marks the beginning of that time. Life is short, I intend to enjoy the rest of mine. 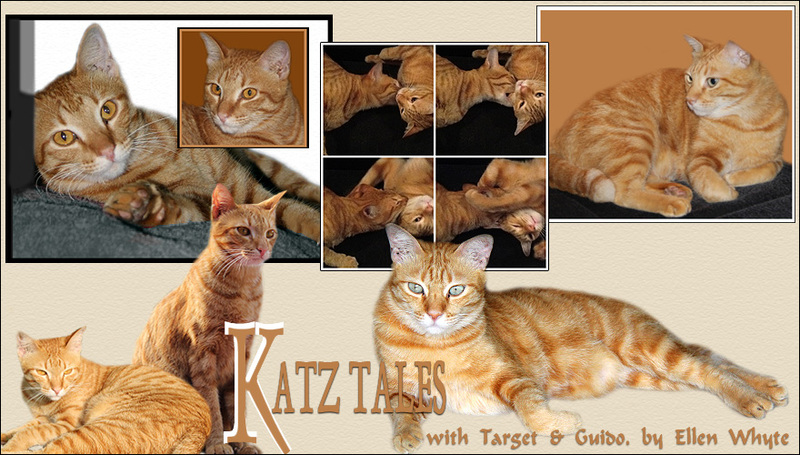 To see more Cats On Tuesday blogs, visit Gattina who started this group or check out the scroll box in the left menu bar. The Spice Cats tagged Target who just had the snip and Au who is a good big brother to Target for the "tell us 3 new things about yourself" meme. 3. Au says it's not so much fun when he gets pushed away from the biscuit bowl by a starving kitten! 1. Is finding everything new. There's leaves, snizzle circles, walks with Au across the street, interesting piles of newspapers, shoe laces... and endless list of new and fascinating things to see EVERY DAY! 2. Has discovered chocolate brownies. He's not allowed more than a crumb because chocolate isn't good for cats, but he's developing longterm plans to get into a bakery, somehow, somewhere. 3. Best of all is that Target has new hair growing back under his tail! Frieda who has lovely toes and whose mum blogs in German and English. PS the doggy shown below has been returned to his owner, and the kitten that fell into the drain is still alive and well! Came across a fantastic story today: South African rugby player Bryan Habana challenged Cetane, a two and a half year old cheetah, to a race last year. I missed it but the article is still online at CNN. Watch the video to see who won! Afterwards check out the San Diego Zoo Cheetah Run Safari where cheetah ambassadors Majani and Kubali race and chase for fun, exercise and raising awareness for the plight of the wild cheetah. We have an open drain pipe outside that we covered with a tile and two bricks. Yet somehow it got moved and one of the kittens fell into the drain. Luckily we heard it squeak and went out to look. Tom has VERY long arms and he was able to reach down and get it out. We hope it will make it but it was a very wet, very scared kitty. We dried it off and gave it back to the mummy cat. She lets us touch her so hopefully she'll accept it back - even with funny drain smell. Here she is with her previous kitten that did make it. PS If you're thinking of adopting a dog, and you live in Selangor, Malaysia, consider this one! This abandoned dog found yesterday is a Great Dane/local mix. As the finder says, "It was in terrible condition, and bleeding. Very skinny and initially we thought it had a great wound but after washing the dog, we found out that the ear was torn. It's very gregarious and such a sweet dog. I would love to adopt it but I live in an apartment!" The dog will shortly be taken away so if you are interested, contact me at katztales AT lepak.com and I'll put you in touch with the right people.